Given that the DRM1/DRM1X have been out of stock for some time and some people have asked for details about expansion, I thought I'd write up something about the workings / options for expansion. Exp-Filt switch - 3pin header. There is a jumper setting on the DRM1 to select either HP or LP filter response - a simple SPDT toggle switch can replace this jumper. Those two headers expect standard 1V/Oct CV inputs to the VCO, VCF, VCA. I put some active electronics to feed them - for summing and for polarizing. The Amp sides have 'Initial' controls (DC generators) and polarizing CV modulation inputs. This replaces a DRM1 option header which syncs the VCO with each trigger. The switch selects 'self-sync' (ie. from the master trigger) or from Sync socket on DRM1X - that passes through a standard comparator pulse conditioner. The DRM1X allows you to 'disconnect' the master trigger from the filter side and then adds the extra controls so you can trigger it independently. Pin1 is where we feed the extra trigger - there's circuitry to combine a manual button trigger with an external trig input - passes through standard comparator conditioning. Pins 2 & 3 simply connect to an SPDT - join the contacts to select 'master' triggering. Hope that helps // hope that is relatively clear?! Add me to the pool of people who want one (and have bugged you over email about it), and would love a DYI solution if someone comes up with a module or kit. Batchas, can you offer any tips or photos of your build? I made the panel at Whitewall and I don’t like it at all. Of course it’s handy cause now I have the module running, but I don’t like the finish (like paper matt) and I don’t like this dibond either (cannot make clean holes etc etc). Of course it’s be possible to go the pcb screenprint way like the original, but it’s much more work to get all in the software for the manufacture. Pers. I don’t have time for this I’m afraid. For Whitewall I made all in illustrator, exported as tiff, finished. And I’m fast in a software I used many years professionally, while making the Orgone Accumulator panel for instance was as first try a pita work. Believe me. The prob being the formats needed for the pcb print which I never worked with before and the sftware needed for thihs (pcb circuit tools). I can't tell much more than what states in the op about the circuit. There are pins behind the DRM1 which connect most directly to whichever in/out you'll need. For the -/+ pots I used atternuvators chicklets I had in stock from fonik (if I remember well). Very handy to make quick atternuvators with any pot. Anyway, I mean you'll need a circuit if you don't have these to make the -/+ FM and AM. You could decide to go only positive too. Why not. This is what I'd do. Here is the layout I did. It’s different from Tom’s original creation. I had what I needed in mind and did it according to this. I don’t remember why I had to give Whitewall a file bigger than the panel itself (looks strange) but I have no tool here at hand to manipulate and crop the file (crashes non-stop on this new mac). Anyway. It’s easy if you have the tool. The photo in the system is not actual cause I didn’t have back then the right knob colours nor the right bananas… But you get the picture. And here's the original illustrator file I made if you need to make it fit your needs. See attachement. For Whitewall I had to put the colour for the background so they print this colour. Was not easy to match the exact pcb red colour! And it turned matt anyway. Actually I'd choose today the metalphoto on alu from Whitewall for this panel. Cause they put a plastic film on it. I ordered 1 of these for my buchla later. 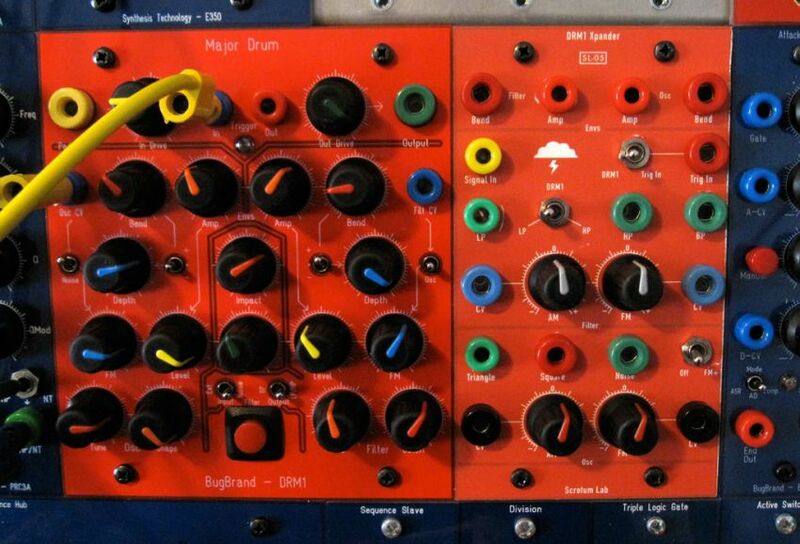 It looks horrible on my buchla (never used it because of this), but might look quite good on the bugbrand (glossy). Except the red... You'd have to find the right tint and change it in my .AI original file. Remember if you go this way that you'll have to make all holes by yourself. I went Whitewall as a test. Ordering 1 x pcb was not possible, expensive and I did not know how to do these GERBER files back then. Whitewall was as I mentionned much more easy to do cause I could send a TIFF. And very cheap. Sorry I cannot offer any pcb panel, much too busy atm. I don't have the tools needed on this computer etc etc. Oh and remember that my panel is a bit different than Tom's original one. And the switch on my panel named FM+ is a bad idea. I would not do this if you decide to use my layout file. Instead you could add the manual switch/push button for trigger like Tom's did on his panel. So. Need to go now! Batchas, thanks a bunch for the detailed info! Much appreciated. Not sure if this is a DIY project I can take on myself, but happy the info is out there! Any pointers for how to do this? Would love some chromatic FM boings from the DRM1. I'll edit the orig. post now.